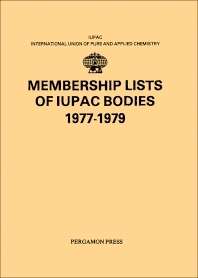 Membership Lists of IUPAC Bodies 1977-1979 contains names of IUPAC members, their category of Membership, and their division or committees. This book is divided into 29 chapters. Each chapter contains names of the members of the specific division, their position, and some general personal information.